The information contained on this page is for general information purposes only. The information below describes what is on the horizon for molecular imaging in traumatic brain injury and is currently being researched and/or has limited use at this time until approved. Traumatic brain injury (TBI) is a complex disorder, as it varies depending on the part of the brain involved, the extent of injury, the post-injury protocols/progress, and subsequent inflammation1. While there are over 2.5 million emergency room visits for suspected TBI in the United States annually2, it is suspected that an additional 4 million mild TBI’s occur each year. Studies of civilians with TBI reveal that 49% develop a new psychiatric illness in the year following the injury3,4. Recent evidence has indicated that even a single concussive event can lead to detectible amount of tau protein accumulation5. Large accumulations of tau protein are believed to cause Chronic Traumatic Encephalopathy (CTE)6 which has gained considerable attention because of the implications for American football players. Nuclear medicine studies can contribute significantly to the diagnosis and the monitoring of the progression of TBI. Single Photon Emission Computed Tomography (SPECT) is recognized as a nuclear medicine technique that can demonstrate evidence of TBI by the American College of Radiology7, the European Association of Nuclear Medicine8, and the SNMMI9. However, SPECT is not entirely specific and in some cases the SPECT findings of TBI can be similar to toxic injury or other disorders. This limitation can be overcome if the areas of the brain involved in the default mode network are examined. For example, it is clinically challenging to differentiate TBI from post-traumatic stress disorder (PTSD) in military personnel. Yet, when the default mode network is examined, a striking difference emerged10. TBI could be distinguished from PTSD using SPECT with 94% accuracy (sensitivity = 92%, specificity = 85%). 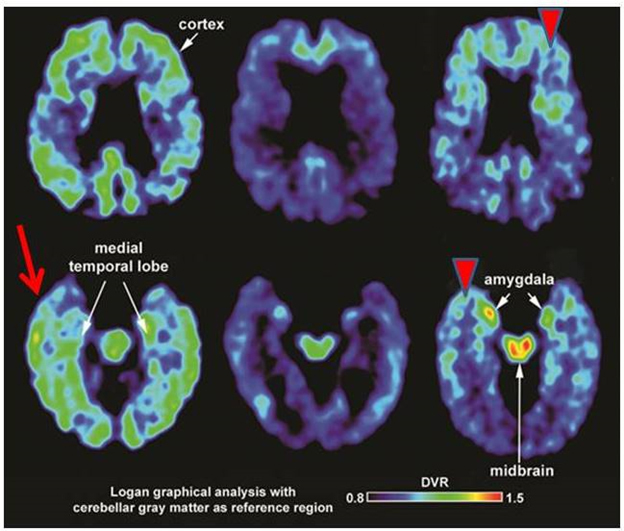 In addition, the ability to distinguish PTSD from co-morbid TBI+PTSD was 92% (sensitivity = 87%, specificity = 83%).10 In the figure below, a transverse section of a SPECT scan of the brain shows increased activity in the default mode network of a patient with PTSD, but decreased activity in the default mode network of a patient with TBI. Efforts to directly image tau protein are beginning to yield results. For example, Dr. Gary Small and his group at UCLA have developed a positron emission tomography (PET) tracer which can directly image tau protein. On the horizon, we may see tau protein imaging used to monitor brain health in those exposed to concussive brain injuries11. This tau imaging also has potential value as an imaging biomarker for the diagnosis and monitoring progression of Alzheimer’s disease, which is a disease of both abnormal accumulation of amyloid and tau proteins. The figure below illustrates tau protein accumulation in Alzheimer’s disease on the left, in a healthy control patient in the center and a patient with TBI on the right. Barkhoudarian G, Hovda DA, Giza CC (2011) The molecular pathophysiology of concussive brain injury. Clin Sports Med 30: 33-48, vii-iii. Center for Disease Control and Prevention. Injury Prevention and Control: Traumatic Brain Injury. Available: http://www.cdc.gov/TraumaticBrainInjury. Accessed 3 November 2017. Fann JR, Burington B, Leonetti A, Jaffe K, Katon WJ, et al. (2004) Psychiatric illness following traumatic brain injury in an adult health maintenance organization population. Arch Gen Psychiatry 61: 53-61. Jorge RE, Robinson RG, Moser D, Tateno A, Crespo-Facorro B, et al. (2004) Major depression following traumatic brain injury. Arch Gen Psychiatry 61: 42-50. Tagge CA, Fisher AM, Minaeva OV, et al. (2018) Concussion, microvascular injury, and early tauopathy in young athletes after impact head injury and an impact concussion mouse model. Brain. 141(2):422-458. Omalu B, Bailes J, Hamilton RL, et al. (2011) Emerging histomorphologic phenotypes of chronic traumatic encephalopathy in American athletes. Neurosurgery. 69(1):173-83. American College of Radiology. ACR-SPR Practice Parameter for the Performance of Single Photon Emission Computed Tomography (SPECT) Brain Perfusion and for Brain Death Studies. (2014) http://www.acr.org/Quality-Safety/Standards-Guidelines/Practice-Guidelines-by-Modality/Nuclear-Medicine. Accessed January 7, 2015. Tatsch K, Asenbaum S, Bartenstein P, et al., European Association of Nuclear Medicine procedure guidelines for brain perfusion SPET using (99m)Tc-labelled radiopharmaceuticals. Eur J Nucl Med Mol Imaging. (2002) 29:BP36-42. Juni JE, Waxman AD, Devous MD, et al. Society of Nuclear Medicine. Procedure guideline for brain perfusion SPECT using (99m) Tc Radiopharmaceuticals 3.0. (2009) J Nucl Med Technol. 2009;37:191-195. Raji CA, Willeumier K, Taylor D, et al. (2015) Functional neuroimaging with default mode network regions distinguishes PTSD from TBI in a military veteran population. Brain Imaging Behav. 9(3):527-34. Omalu B, Small GW, Bailes J, et al. Postmortem Autopsy-Confirmation of Antemortem [F-18]FDDNP-PET Scans in a Football Player With Chronic Traumatic Encephalopathy. (2018) Neurosurgery. 82(2):237-246.